We have over 200 of the most popular wheel bearings in range which covers over 42,000 applications for modern and relevant vehicles. 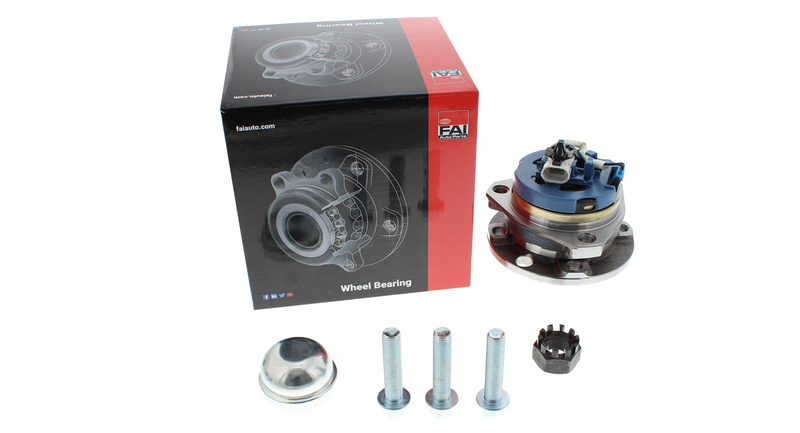 The range includes a complete selection of Wheel Bearings and Hub Bearings and only OEM Quality ABS Sensors and Impulse Rings are use in production. All accessories for fitment are included where necessary, whether it’s a bearing or hub, you’ll find all the nuts & bolts. Our Wheel Bearing range uses the latest materials and production facilities to ensure quality and reliability is maintained. As a safety critical item, our wheel bearings are subjected to a multitude of tests to ensure that the final product meets stringent performance requirements. To produce a high quality product you need high quality raw materials, so we use Carbon Chromium Steel, Heat Resistant Nylon 66 with Glass Fiber, High Performance Grease & Oil and Wear Resistant Rubber. All our wheel bearings are designed and manufactured using state of the art machinery and we use CAD software for bearings and moulds so all parts are modelled pre-production to original specification. 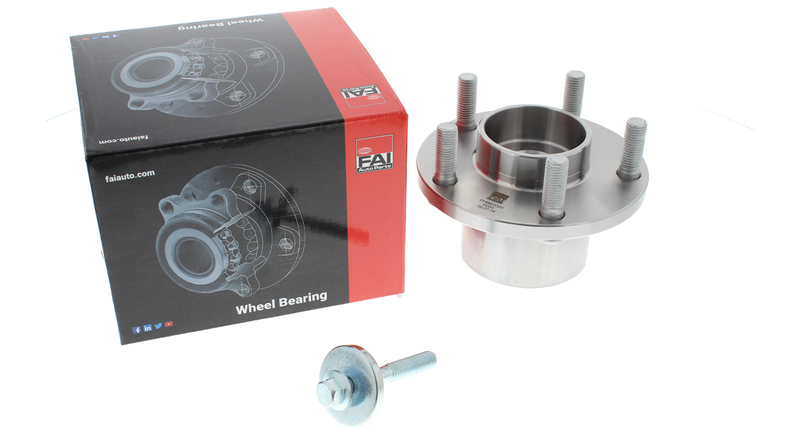 FAI Wheel Bearings are tested at both high and low temperatures to ensure the grease and metals perform with maximum performance and lifespan. Both the raw materials and finished components are thoroughly fatigue tested to ensure that the finished Wheel Bearing has a long running life. Each production batch of Wheel Bearings undergoes dimensional inspection to ensure assembly components are produced to the correct tolerances. Our products are available on all major cataloguing platforms including TecAlliance (TecDoc), MAM, InfoRicambi and more. Wheel bearings are produced using either ball or tapered bearings. Front wheel bearings tend to use angular ball bearings rather than conrad bearings as they can tolerate increased thrust loads. Tapered wheel bearings are a further improvement as they can tolerate higher radial and thrust loads. Rear axles tend to use a cartridge bearing constructed with either ball or tapered roller sets. The Gen 1 bearings are more commonly referred to as cartridge style bearings. The Gen 1 bearings are usually constructed using a double row of angular contact bearings and have been the preferred choice for small and medium front wheel drive vehicles, but have also been used in non-driven wheels as parts of a hub assembly. Gen 1 bearings are comprised of a single outer race, two separate inner racers, bearing cage and ball bearings although tapered bearings can be used if space is limited. Gen 1 bearings are lubricated and sealed for life at the factory. Gen 1 bearings perform well under with induced axial and radial loads that are transferred through the front wheels, especially when turning. Gen 1 bearings can include an impulse/encoder ring, which is integrated into the outer seal. The impulse ring is responsible for wheel speed information to the ABS, TCS or ESC systems. The Gen 2 bearing is very similar in design to the Gen 1 in that it has a double row of angular ball bearings, greased & sealed for life, but the outer race is now integrated into the outer flange. This design offers weight saving, something that appeals to vehicle manufacturers. The flange will have the spigot to locate onto the rotor/drum/wheel assembly, the studs or threaded holes to attach the wheel and, if needed, an ABS tone/encoder ring imbedded inner seal. Gen 2 wheel bearings are generally used on non-driven front/rear axles, mounted to a machined spindle and held in place by a retaining nut. 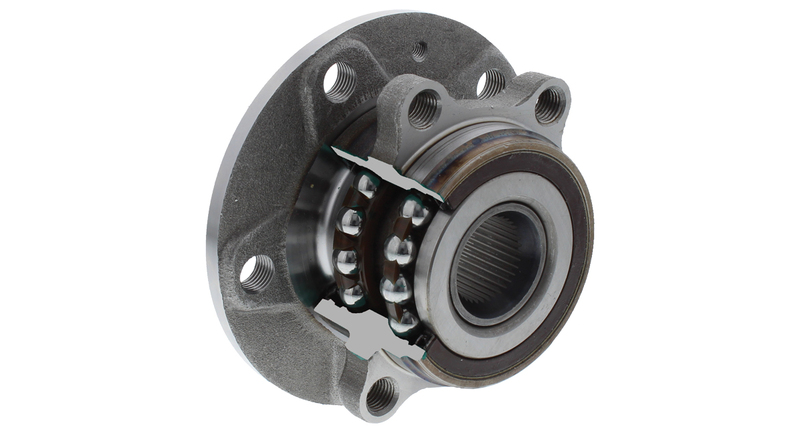 Gen 3 wheel bearings incorporate two separate flanges and a double row angular contact ball bearing design that are sealed and lubricated for life. By incorporating two flanges in the design it allows for a more compact simplified unit. The outer flange doesn’t rotate and is attached to the knuckle or suspension with mounting provisions, either bolts or threaded holes. The inner rotating flange will incorporate the spigot and the threaded holes or studs to locate and retain the wheel. Gen 3 wheel bearings are used in both driven & non-driven applications, however if used on a driven-wheel application, the inner ring will now incorporate splines to transfer torque to the wheel from a splined driveshaft. 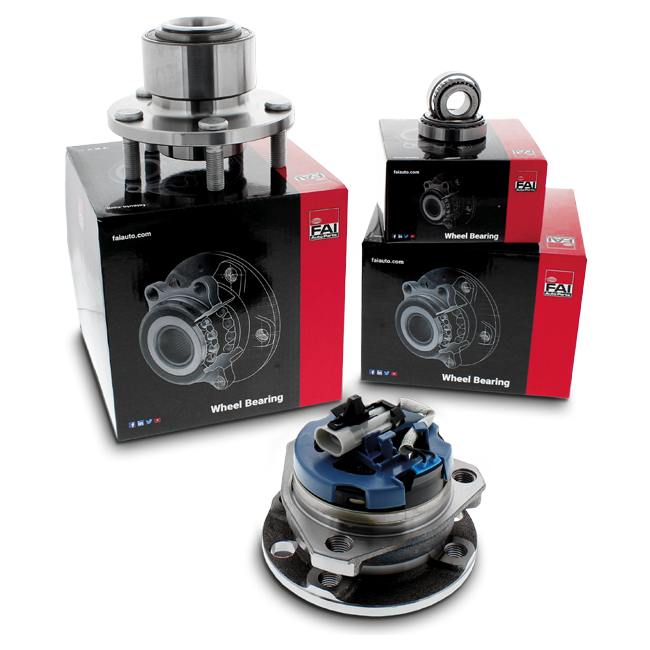 Gen 3 bearings can also have a sensor built in for the TCS, ESP or ABS systems. Bearing seals have changed little aside from the materials, rubber is now the preferred material replacing felt. However, felt is still used for dust shields. Seals rely on a well lubricated contact surface. Poor lubrication will cause overheating and brittleness, this in-turn can lead to premature failure. 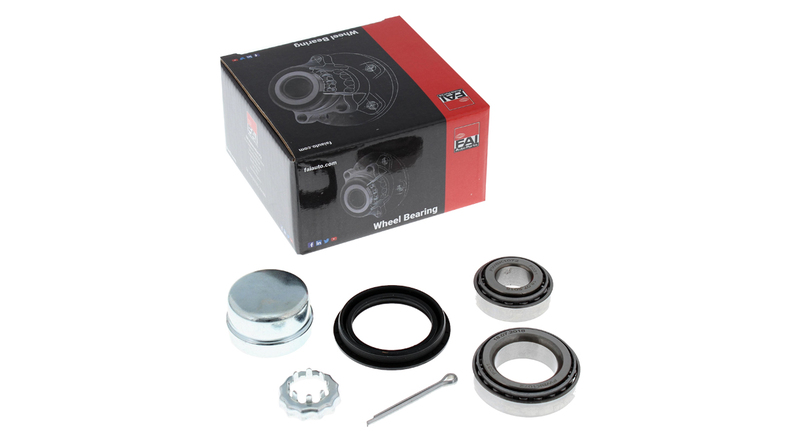 During installation it is recommended to use a bearing installer which will prevent the seal being cocked. For splined shaft installation it is highly recommended to use shaft protector. Remember to refit the dust cap after installation. Incorrectly adjusted bearings will reduce product life expectancy. End play should always be adjusted to manufacturer specifications, too loose or too tight can cause the bearing to fail prematurely. For vehicles with disc brakes the bearing adjustment can also affect the brake caliper which is mounted directly to the steering knuckle. Too much end paly can result in piston knock back on the caliper resulting in too much pedal travel. Most bearings have about 0.001” of interference-fit built into an axle shaft or bearing bore, which means that these types of bearings must be pressed or driven into place. To avoid damaging the new bearing, the bearing inner race must be carefully pressed onto a shaft and the outer race pressed into its bore. Hammering a bearing in place can result in the rollers or balls dimpling the bearing races and causing premature failure. Tapered bearing cups or outer races should be driven in place using a special aluminum driver. Special tools are also available for pressing bearings into a steering knuckle. Lastly, always adjust a tapered roller bearing by torquing to 15-20 ft.-lbs. and spinning the hub to center the rollers in the races. Back this initial adjustment off an 1/8 or 1/4 turn and retorque the bearing to manufacturers’ specifications. Whether installing a ball, roller or sealed bearing assembly, using correct procedures and tools will ensure a comeback-free wheel bearing installation.